After merging with another local funeral home, an increased client base for O.B. Davis Funeral Home in Port Jefferson Station grew beyond what the existing facility could accommodate. Dignity Funeral Homes Inc. approached us with the request of updating and renovating their facilities to meet this new demand and improve their image within the community. The client asked that we provide them with a design that could maximize the use of each space, allowing them to service all clients and families. The scope of work ultimately included both interior and exterior renovations. The first phase included the conversion of an existing lounge and showroom into an additional chapel space to allow the facility to serve a larger number of families throughout the year. A movable partition installed in the room allows increased flexibility by providing a lounge area when all chapels are not in use. Along with the design of this new space, within the footprint of the existing building, an updated aesthetic was introduced for the building that would impart a comforting feeling during a time of mourning. Phase two brought the new aesthetic introduced in the new chapel into the remaining spaces. The two existing chapels and the lobby were given an ornately detailed ceiling design to replace the existing, outdated acoustical ceiling. Attention was given to ensure that maximum ceiling heights would be utilized in each space, while still maintaining all necessary access to the mechanical systems. Lighting was integrated into the ceiling to minimize the need for floor and table lamps in the room adding more function space. 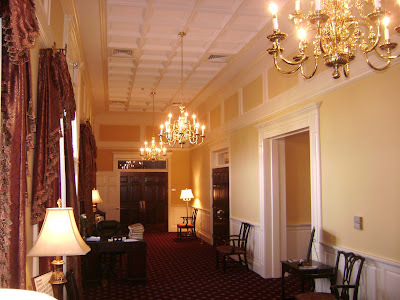 Ornamental wainscoting was installed throughout the building to give a more formal appeal to the rooms. 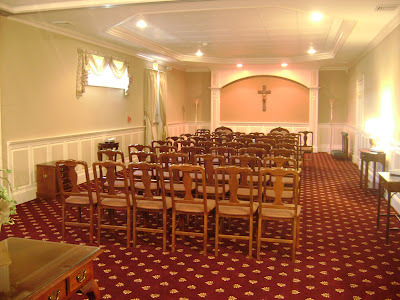 Custom archways and molding details were also created for the three chapels as well as the lobby. Reconfiguration of other areas of the building accommodate larger, ADA accessible, restrooms, as well as remodeling the existing office and arrangement room. The final phase of the project incorporated exterior alterations which had to be coordinated with the requirements set by the Town of Brookhaven Historical District Advisory Council (HDAC) to ensure the design was consistent with the surrounding area and Historic District. The addition of a reverse gable on the main entry facade serves to increase the visibility of the funeral home from Nesconset Highway (Route 347). Construction administration was a challenge since the funeral home was completely operational during construction. Careful coordination and scheduling was necessary to minimize disturbance of the staff and mourning families while the building was renovated. With project restrictions taken into consideration, an effort was made to chose finishes and fixtures that contribute to lower energy use and better air quality wherever possible throughout the project. Above: Phase 3 exterior alterations.